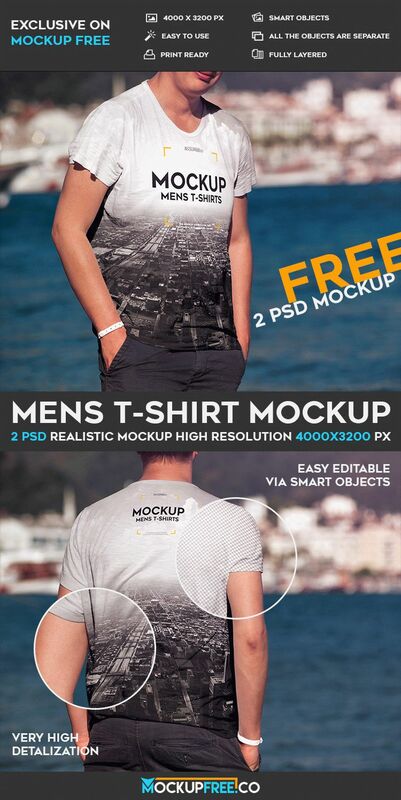 Download for free our new awesome Freebie – Men’s T-shirt – 2 Free PSD Mockups! There are 2 professional mockups for Photoshop, that can be easily used for showcasing the necessary design, product or special design ideas. The successfully made mockup allows you to showcase the front and back of the T-shirt. Also, we want to draw your attention to the background. A man stands against a beautiful view that is blurred. We are sure, that such presentation will be pleasing to look at. Our new free PSD mockups were created by professional designers. Download it only once and you will be able to ensure the quality and ease of use. Using such professional free mockup, you can create the best advertisement for your company or design very quickly. We sincerely hope that this awesome free mockup PSD will be useful for you, your company or your clients and bring you lots of positive benefits in future!